I AM RESURRECTING THIS. So there’s a little bit of back log. I was looking through some of my old recipe emails and maybe four years ago you sent me a link to the spoonforkbacon blog. First of all, they have such a great theme going on. The site is set up so well and the recipes they feature are basically all things I want to make. So I went through the ENTIRE blog and picked out every recipe I want to make. This is one of the recipes that really stood out. Also I was craving Korean BBQ. So here’s the recipe. The nice thing about this recipe is that there are a couple of sauces you can choose from. 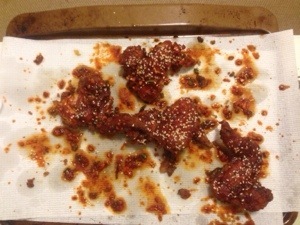 I made then with the spicy koren BBQ sauce both times. I’m not sure how hard it would be for you to find gochuchang in Paris… I mean I got it at Shaws but this is the US. I bet the less spicy honey sauce is good too. Also I used a deep fryer because I have one but you obviously don’t need that. Lastly, I made this recipe twice in one week. That’s how good they were. The first time for kels, Travis, Ashley, pat, Seth. The second time for ash, vane, Katherine, Jamie, Lindsay, Julie, desa, and probably other girls that I’m forgetting about right now (there were a lot of us). These don’t look that appetizing in the picture, but they were literally half gone by the time I tried to take a picture after bringing them out. This entry was posted in Uncategorized and tagged bbq, chicken, groups, korean, wings. Bookmark the permalink.